We can accommodate most rush order requests because we stock large quantities on the majority of our products. Please allow a minimum of 2-4 business days to process and ship your custom crystal awards. Additional lead time is always appreciated whenever possible. Please also note that we are the wholesale manufacturer, and while that allows us to keep pricing low, it also means we build the entire product from scratch for each custom order. As a result, some products may require more build time in comparison to others. See the map below for transit time to your location. 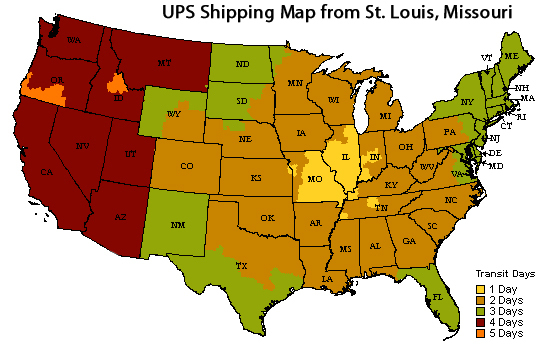 Our customers are welcome to email us or call us in St. Louis at (636) 537-1517 to find out a more detail arrival time of a specific product. Orders received after noon Central Time will be processed the next business day. Contact us about a rush order before ordering online to ensure on-time delivery, as product build time varies. We do not charge for any additional costs associated with rush orders without client approval. There may be additional charges for expedited shipping to your ship-to location. We will notify you of approximate shipping costs before they are added to your order. Shipping options below are from date order is ready to ship, not when order is placed.